MIAMI, FL--(Marketwired - March 31, 2016) - PortadaLat, the two-day annual gathering of key brand marketing, advertising, media and digital leaders from all over the Americas taking place on June 8-9 in Miami, is announcing an amazing speaker roster. 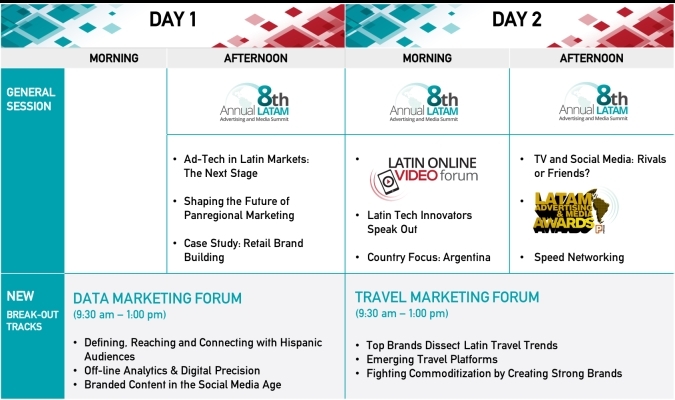 PortadaLat comprehends the Latin American Advertising and Media Summit, The Data Marketing Forum, the Travel Marketing Forum and the Online Video Forum. Plus more major speakers to be announced soon! #PortadaLat will provide a unique setting for marketers targeting Latin consumers in the U.S. and Latin America to delve into how Big Data can revolutionize marketing efficiency. Latin America and the U.S. Hispanic market are a key inbound and outbound destination for global Travel and Luxury marketing companies. Hear how major brands are approaching the region and their innovations in digital marketing. From Content Marketing Technologies and Practices, to Digital Targeting to Crowdsourcing, leading experts will provide actionable insights to major leading practitioners about major innovations. Expanded Speaker Roster of Brand Marketing and Media Stars. Expect the #PortadaLat Speaker roster to be filled with dozens of key brand marketers, major media agency players, key social influencers and media stars. A unique hub for excitement and idea sharing on the OTT Revolution throughout the Latin world. Monetization, Viewability, YouTube, Facebook and beyond. To align your brand with the eight annual edition of PortadaLat (http://www.portada-online.com/events/portadalat) the main conference for Brand Marketers, Digital Innovators, Media Properties and Influencers targeting the Latin American and U.S. Hispanic markets, please contact Portada's Sales and Marketing Director Kelley Eberhardt at kelley@portada-online.com. PortadaLat 2016 Two day event of leading content, market intelligence and networking opportunities.